Remember, you have the knowledge and the confidence. You will succeed!!! Check with the Youth Resources page to access calendars of events from organizations all over the state as well as media contacts. 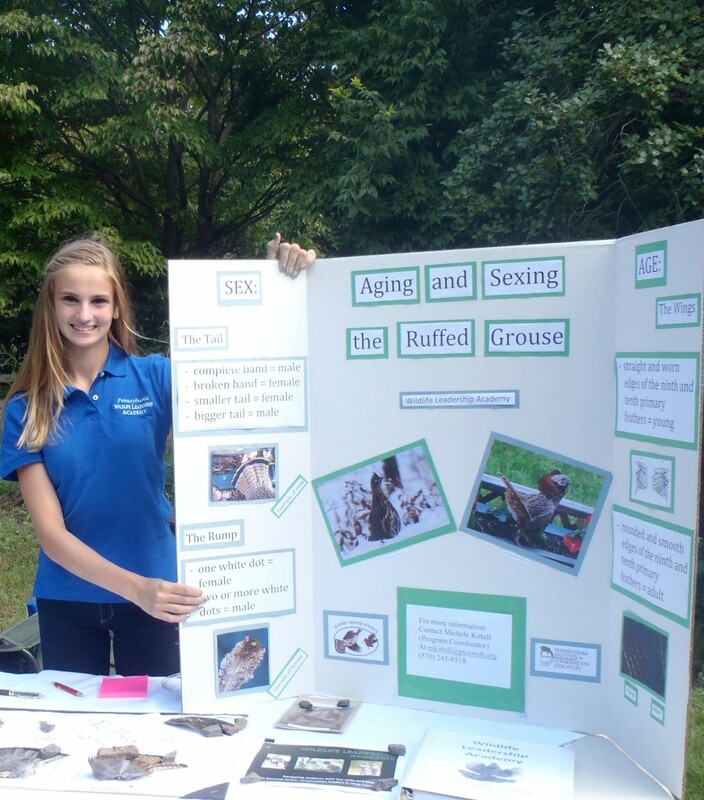 Do not hesitate to contact Katie at kcassidy@wildlifeleadershipacademy.org, for help finding outreach opportunities! Check out the Educational Activity Values to see the subcategories of outreach and get ideas! And don’t forget to keep track of your activities! Download the Outreach Activity Report Form. Record books should include a completed Outreach Activity Reporting Form. Be neat – it matters! Please DO NOT use plastic page protectors – consider the environmental impact! Students who submit their Early Bird Record Book will be invited to attend the The Wildlife Society Meeting, PA Chapter and take a tour of the PSU deer pens in the spring or the Keystone Coldwater Conference (students from the fish camps!). Students who submit their Final Record Book will compete to become Assistant Team Leaders. *Record books will be returned by the Program and Outreach Coordinator after being scored* Your record book will be graded based on the amount and types of outreach activities you were involved with as well as the quality of your record book, as outlined on the Becoming A Conservation Ambassador Outreach Booklet (downloadable copy above). Early Bird Record Book: to qualify for special achievement rewards, such as a the invitation to attend a professional conference, you must submit a record book documenting your outreach achievements. The deadline for submitting your Early Bird Special record book is November 15. Your record book will be returned to you so that you may continue to add to it throughout the year and resubmit for the final deadline to compete for assistant team leader position at camp (see below). Final Record Book Submission and Assistant Team Leader Selection: Return to the following summer field school as an Assistant Team Leader! These positions are awarded to the top four student who collected the most points for outreach activities conducted between the end of your field school experience and March 15th. In order to qualify, you will need to complete and send in a record book as mentioned above. The Assistant Team Leaders selected may be awarded college scholarships and will receive a tuition scholarship to return to the next field school and participate as an Assistant Team Leader. Apprentice Selection: Assistant Team Leaders can compete to be selected to return as an Apprentice for the next field school by submitting their record books. Apprentices assist Academy interns and coordinators with field school logistics and behind-the-scenes work. To compete for these positions you must submit a record book documenting your outreach activities. Reporting your accomplishments is very important! We have many organizations, foundations, businesses and individuals that support the Academy. It is vital that we show them what you have accomplished. The reports you send in and your record books allow us to give them feedback they deserve. Your reports will help us to continue to operate the Academy and provide this unique learning experience to many other Pennsylvania youth!